Johnson, Ray. Interview by John Held, Jr. Mid-York Library System, Utica, New York. December 2, 1977. Edward M. Plunkett, et al. Plunkett, Edward M., Lawrence Alloway, John Russell, Suzi Gablik, William S. Wilson, Henry Martin, Robert Pincus-Witten, Karen Shaw, Robert Rosenblum, Lucy R. Lippard, Tommy Mew, Toby R. Spiselman. 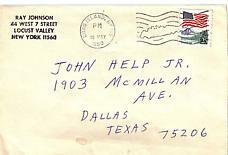 "Send Letters, Postcards, Drawings, and Objects . . . " Art Journal XXXVI (Spring 1977): 233-241.